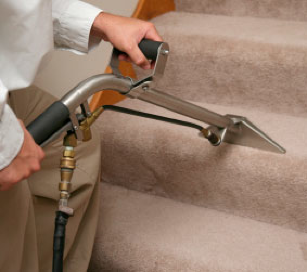 Welcome to First Class Carpet & Tile Cleaners, Inc.
First Class Carpet & Tile Cleaners, Inc. is a family owned and operated company and we understand how difficult a task it is to keep a house well-maintained. We try to make it easy for you by providing personalized services to help you maintain a clean, fresh smelling home. As carpet and tile cleaning specialists in Lee County, Florida, we offer high quality carpet and tile cleaning to residential and commercial customers. Are you tired of carpet cleaning companies that advertise very low prices - until they show up at your door? If so, call First Class Carpet & Tile Cleaners. We will charge you the same low price we quote, and deliver complete satisfaction - guaranteed! No Hidden Charges! If you're looking for a good local carpet and tile cleaner, a dependable company to clean your carpets right the first time, we think you'll like us because making our customers happy is our first priority. Our team of expert cleaners is well-trained and experienced. We take the utmost care to avoid any damage while handling your upholstery and floor. Since we strive to provide the best quality service, we are also dedicated to using the best quality products for cleaning. You can rest assured that your cleaning woes are in good hands. Thank you for choosing First Class Carpet & Tile Cleaners, Inc., the most trusted name when it comes to carpet and tile care services in Lee County, FL. We appreciate your visit to our website and hope you found all the information you were looking for. We hope to serve you soon. Don’t forget to about getting a free estimate! For affordable carpet and tile cleaning by upfront professionals, call First Class Carpet & Tile Cleaners, Inc. Call 239.772.3434 to schedule an appointment today! Where you get it done right the first time!